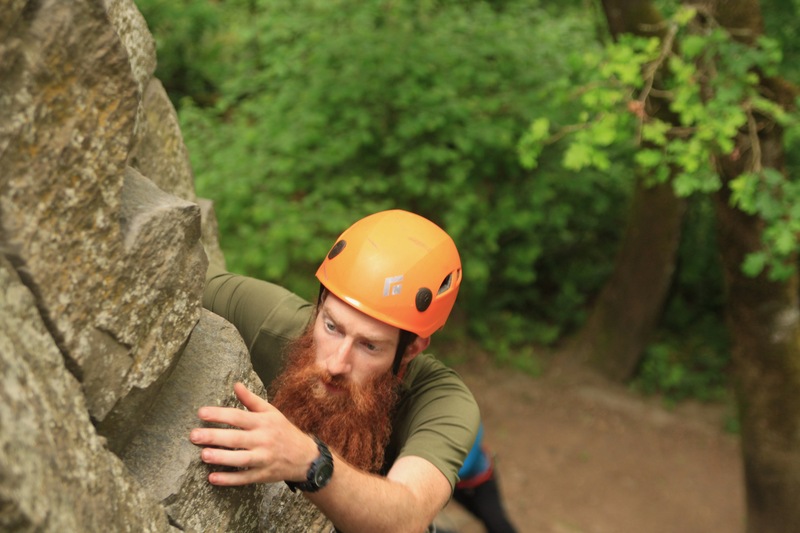 Oregon is home to some of the best rock climbing destinations in the world. And while most people think of Smith Rock when they think of climbing in Oregon, there are great climbing spots located all over the state, like Broughton Bluff, a 40-foot-high basalt cliff with over 100 climbs for every skill level and located just minutes outside of Portland, in Lewis and Clark State Park. Portland sports a vibrant climbing community with multiple rock gyms like Portland Rock Gym and The Circuit offering regular classes and instruction. There’s beginner night at The Circuit every Wednesday, or Friday and Saturday Night Heights at PRG. Local outlet Next Adventure boasts bargain basement rental options: climbing shoes for $8, and other cheap alternatives for gear. Early on Saturday morning, with a slight hangover and a large coffee, I met up with a couple climbing friends and made the fifteen minute drive down I-84 East to the Lewis and Clark State Park exit. We arrived at the trailhead just before 9:00 a.m. and found only a few cars in the nearly-empty parking lot. The trail started a few steps from where we parked the car, and after 10 to 15 minutes of hiking up the hillside, cliffs appeared through the dense trees, grey-brown against the green. I put on my harness, uncoiled the rope, tied-in and began to climb. The smooth basalt felt cool under my fingers as I pulled my way up the side of the cliff. I reached the top and looked out over the trees. Below me, the dark water of the Sandy River wound its way north to where it spills into Columbia. Above, a red-tailed hawk circled, its outstretched wings silhouetted against the early morning sky. After a few moments above the canopy, I lowered back into the trees and down to the ground. The next few hours were spent trading belays and climbing until our fingers ached, while the shade of the trees kept the heat of the day at bay. A couple hours after midday, we shouldered our ropes and followed the trail back to the parking lot, and back towards the city.